Everything you do makes an impact on the people you meet, on the friends you hang out with, on the family you live with and on the professional front you deal with. A successful person is not the one who is good at his monetary affairs but someone who can well balance every single task of his daily routine. With different people, our behavior goes different. Our level of communication and attitude changes with person to person. There are social and personal values that we must partake. As long as professional aspects are concerned, occupation and workplace has different set of responsibilities and it demands a different level of devotion. One may get across clients of almost every type. So patience should never run lose and one really has to grind his best efforts to prove one’ expertise. Especially for the designer, the workplace is more like a creative box, in which they enter every day, soar above with the ability of imagination, and come back within the same walls with bigger picture, more ideas and thoughtfulness. 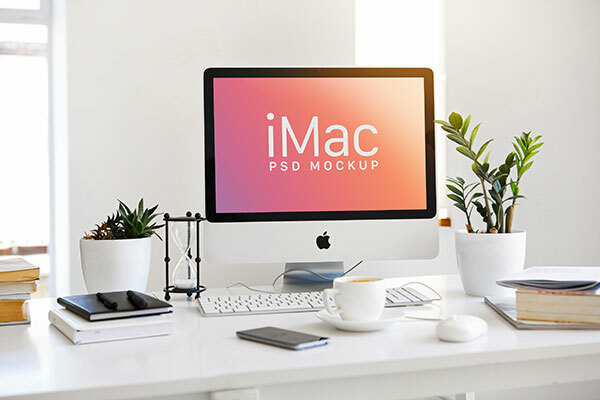 Now here I am providing before you a free Apple iMac workspace mockup PSD that you can use professionally for commercial or personal projects. This mockup shall help you putting in your design piece to make a presentation out of it. Clients take a notice of the way you depict the projects so if you want to show him his website’s layout, templates, themes then you can totally and easily insert in the elements so he may have a clear cut idea how the design of his website will look like, or what theme he better be choosing for the website. We will be showing up more freebies for your help you just have to mention us your queries and our team will get back to you. Subscribe us for the daily dose of design. We are highly overwhelmed by your response and we make sure we will never run out of support and encouragement from you all. It is priceless to see such a good family. Here we go!